Every child is a special gift from God. But caring for a special needs child can stretch a family to its limits. The needs of a child with disabilities often become the central focus of attention, overwhelming and isolating other family members. 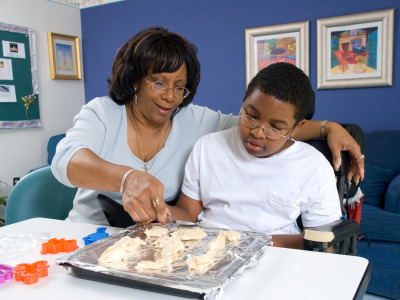 Respite care can play an important role in maintaining the health and stability of these families by giving them a break. Parents of children with special needs desperately need respite to provide a break from the stress and exhaustion that result from providing constant care. The demands on these parents are so great that they have little time for rest and focusing on personal needs and relationships. Help is available through Hope House Children’s Respite Center (for medically fragile children) and WeCare Respite (for non-medically fragile children). Through Children’s Respite, parents of these special needs children can take some valuable time to rest and then resume caring for their children with renewed strength. Parents, who often have difficulty locating qualified and willing caregivers, find excellent care for their medically fragile child at Hope House Children's Respite Center. Friendly faces welcome the children as they enter a beautifully decorated, peaceful environment. While at Hope House, the children enjoy our multi-sensory activity room, Hydrotherapy room, wheelchair accessible playground and lots of crafts and fun activities. Parents know that Hope House is a safe place where each child is treasured and receives lots of tender, loving care. WeCare Respite Saturday provides a four-hour period of respite care to families with children who are less medically fragile than those we serve through our Hope House Children’s Respite. These children typically have Autism, Downs Syndrome and milder forms of Cerebral Palsy. WeCare Respite Saturday is available once a month and affords families of children with special needs time to rest and recharge their batteries by providing care for their loved ones through our loving experienced staff and volunteers. Every WeCare Respite Saturday is a special time that both children and volunteers look forward to as a time filled with fun, activities and social interaction. Parents take advantage of this time to do personal errands, visit with friends, have a date with their spouse, catch-up on household chores or just rest. Respite Community Outreach supports churches and other groups interested in offering a respite outreach ministry to families of children with special needs. We partner with PURE Ministries, a nationwide movement to awaken the church to reach out to families affected by disability. Contact Tonya Logan or Tina Hardy, or visit the Pure Ministries website to learn more about how you and your church can make a difference. To be eligible for center-based respite care at Hope House, children must be ages birth to 21, medically fragile and non-ambulatory. During their stay at Hope House, children must be free of acute infectious illness. Hope House is unable to serve children with self-injurious or aggressive behaviors, major psychological disorders, ventilator dependent conditions or communicable diseases. Eligibility is determined on an individual basis. Children served through WeCare Respite typically have Autism, Downs Syndrome and milder forms of Cerebral Palsy. WeCare is unable to serve children with self-injurious or aggressive behaviors that may endanger other participants. After reviewing your application, we will set up a Family interview. the Hope House/WeCare staff will meet to determine if our programs are appropriate settings for your child.